Although many people are all about the healthy habits these days, we're incorporating healthy ingredients in a majority of our meals. The Instant Pot has enhanced healthy cooking for me and the best part, cooking has become much easier and faster so I can focus on more quality time with my family. 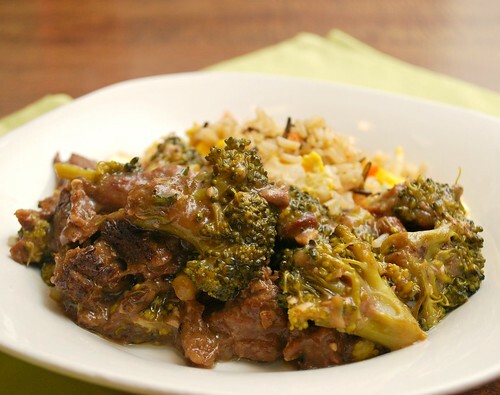 We recently enjoyed this Beef & Broccoli recipe, adapted from my traditional stovetop version. The tender flank steak and fresh broccoli in a savory garlic sauce hit the spot over vegetable fried rice! So if my stovetop version is great, why bother with making the dish in a pressure cooker? The answer: tender beef and less time for me at the stovetop! By having everything done in one pot with minimal babysitting, I was able to prepare other parts of the meal, set the table, sneak in a quick read with my little guy, check the laundry, etc. It's almost like the slow cooker "set it and forget it" idea but without several hours of waiting. This recipe starts my pressure cooking the beef first. The last part is adding fresh broccoli florets and pressure cooking it ever so briefly. I learned that you could set the IP for 0 minutes which is perfect for vegetables that don't require long cook times. By setting it for 0 minutes, the IP takes a few minutes to come to pressure and immediately starts naturally releasing pressure. The amount of time it takes to do that is just enough for the broccoli to cook perfectly. Additionally, you can use frozen broccoli florets after pressure cooking the beef and simply stir in until warmed through. In a medium bowl, place beef and season with garlic powder, onion powder, salt and pepper, tossing to season thoroughly. Add 2 tablespoons cornstarch to bowl and continue to coat beef. Add olive oil. When oil has heated, add garlic and onion, cooking until softened. Add 1/4 of the seasoned and cornstarch coated beef to pot, browning in batches, Remove browned beef and repeat with remaining beef. Transfer all browned beef into IP. Add 1 cup water, oyster sauce and soy sauce (coconut aminos or gluten free tamari). Stir to combine. Once at pressure, the display will reflect 10 (the number of minutes you initially set ) and will begin to countdown to 0 minutes. When the IP beeps after pressure cooking for 10 minutes, allow your IP to naturally release pressure for 5 minutes. While naturally releasing pressure, the display will reflect numbers counting up from 1. The numbers indicate how many minutes the IP has stopped cooking since it beeped (or how many minutes it has been naturally releasing pressure). No need to touch your IP while it naturally releases pressure. When the display reflects 5 (which is 5 minutes since the IP has beeped), turn the setting on top of your IP to venting. Doing so allows the IP to quickly release pressure. I use a wooden spoon to carefully turn the setting to avoid close contact with the potential steam. You may also want to turn your IP away from cabinets to allow the released steam to escape freely. The pin at the top of your IP will drop when all pressure has been released and it's safe to open. Add fresh broccoli on top of beef and do not stir. *You can also use frozen broccoli florets and if using frozen, simply add frozen broccoli and stir to warm through. No additional cooking is required and you can serve up once broccoli is warmed through. Secure the lid of the IP after adding fresh broccoli and ensure the valve is set to SEALING once again. Once at pressure, the display will reflect 0 (the number of minutes you initially set ) and it will begin to countdown to 0 minutes, which happens immediately. When the IP beeps after pressure cooking for 0 minutes, turn the setting on top of your IP to venting. Doing so allows the IP to quickly release pressure. I use a wooden spoon to carefully turn the setting to avoid close contact with the potential steam. You may also want to turn your IP away from cabinets to allow the released steam to escape freely. The pin at the top of your IP will drop when all pressure has been released and it's safe to open. Serve up with your preferred side dish - we love ours over vegetable fried rice made with brown rice! I like the ingredients listed, so will try this in the near future. But, because your broccoli in the picture does look overcooked, I'll cook the broccoli separately just until crispy-done and still bright green, then serve it directly on top of the rice on the plate, then add the beef mixture on top of the broccoli. Cooking it in the IP (even at zero minutes)will cause it to get too mushy for my liking. I've made other IP recipes that use broccoli and don't like what happens to the broccoli in the IP, so I always cook it separately. how many servings should this make? Is there nutritional values available?